Paul Ackerman (1908-1981) was a Romanian-born French painter who painted in the cubist style. He was greatly influenced by the work of Jacques Villon (1875-1973), brother of Marcel Duchamp. During World War II, he survived a German prison camp. Sir Lawrence Alma-Tadema (1836-1912) was one the most renowned painters of the late 19th century Britain. 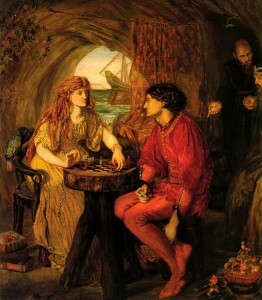 He was one of the finest and most distinctive of the Victorian painters. In 1865, he painted “Egyptian Chess Players,” which he sold in Berlin to a Moscow banker. 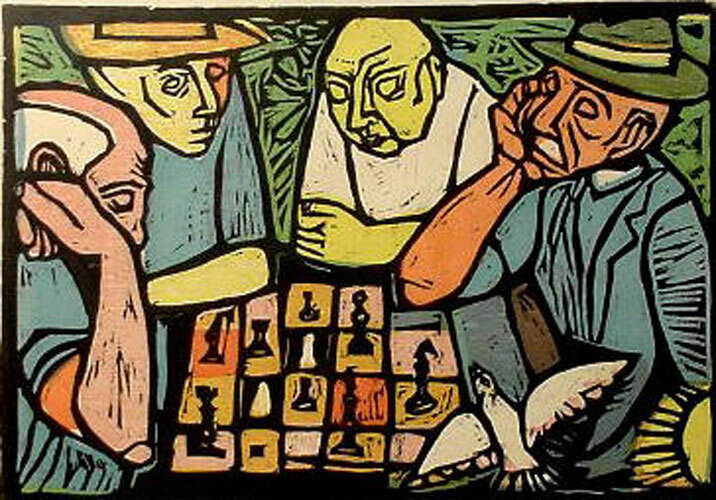 Irving Amen (1918- ) is known as a master printmaker. He has produced thousands of woodcuts, etchings, lithographs and silk screens. Some of the titles of his chess works include Chess Strategy, Two Chess Games, Duel, Chess Board, Chess Players, End Game, Expresso, Game of Kings, and The Move. Sir Alfred Charles Stanley Anderson (1884-1966) was an English Painter who started out as a heraldic engraver. 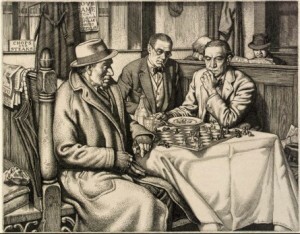 His 1932 painting, “In Check: Scene at A London Eating-House” hangs in the Smithsonian American Art Museum. Sofonisba Anguissola (c. 1532-1625) was an Italian painter of the Renaissance and trained by Giulio Campi . Her father was a member of the Genoese minor mobility. 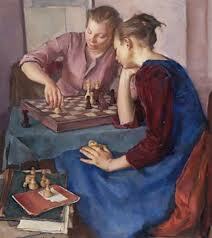 Her 1555 “Le Giocatrici de Scacci” (Artist’s Sisters Playing Chess) painting hangs in the Muzeum Narodowe w Poznaniu (National Museum in Pozan, Poland). 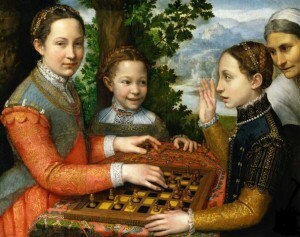 The painting shows Anguissola’s three sisters (Lucia, Minerva, and Europa) playing chess. Samuel Bak (1933) was born in Vilna, Poland (now Vilnius, Lithuania) and survived the Holocaust. 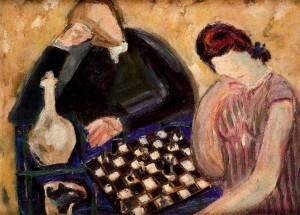 The theme of chess appears in many of his paintings. 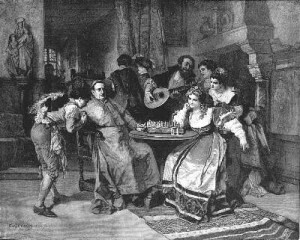 Charles Bargue (1826-1883) was a French lithographer and painter. He is mostly remembered as the creator of a classical drawing course. One of his paintings from 1880 is entitled, “Le jeu d’échecs” (The Chess Game, also known as Playing Chess on the Terrace), a very nice oil painting depicting two French chess players with a kibitzer looking on. 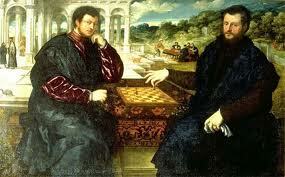 His chess painting was his last work. Bargue died of starvation at a charitable institution. 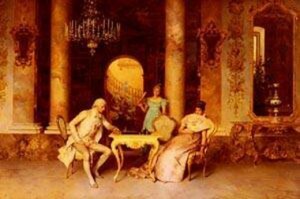 The painting was later owned by Mrs. William H. Vanderbilt of New York. Lubin Baugin (c. 1612-1663) was a French painter. 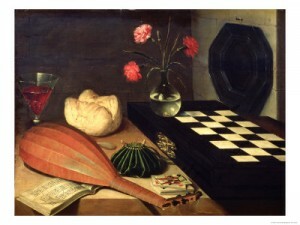 Around 1630 he painted “Nature morte a l’echquier ou Allegorie des cinq sens” (Still Life with Chessboard or an Allegory of the Five Senses) which hangs in the Louvre. It features a black and white chess board with seven other objects. 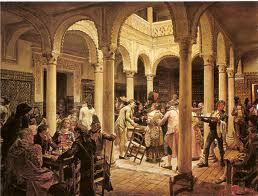 Carl Becker (1820-1900) was a German history painter and was president of the Prussian Academy of Sciences. His 1892 painting, “Franz, Adelheid, and the Bishop of Bamberg” hangs in the New York Metropolitan Museum of Art. 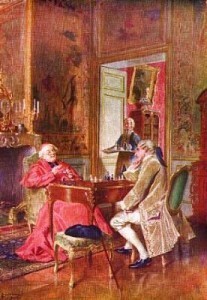 It is a scene in Goethe’s play where Adelheid and the Bishop of Bamberg play chess. Francesco Beda (1840-1900) was an Italian Academic Classical artist. 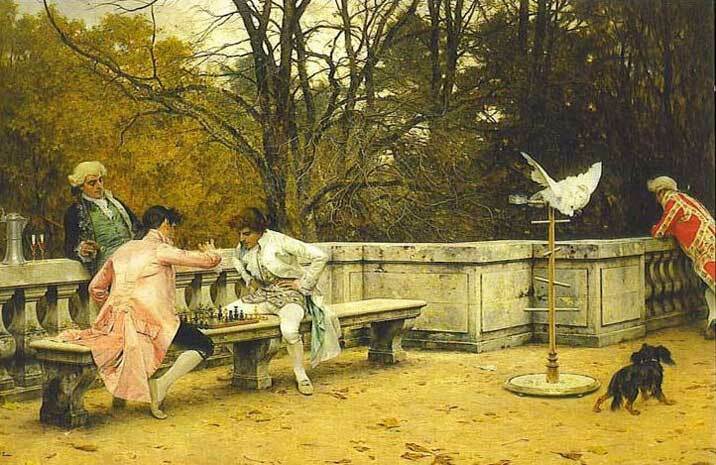 In 1880 he painted “Partita a scacchi” (The Chess Game). David Joseph Bles (1821-1899) was a Dutch oil painter. 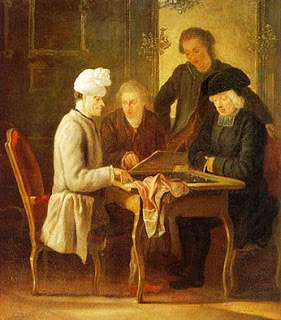 He painted “Chess Players” which was stolen from a museum in 2000. Bernard Louis Borione (1865- ?) was a French painter. In 1906, he painted “A Game of Chess,” depicting a Catholic Cardinal playing chess. Francois Boucher (1703-1770) was a French painter known for his idyllic and voluptuous paintings on classical themes. He was perhaps the most celebrated decorative artist of the 18th century. 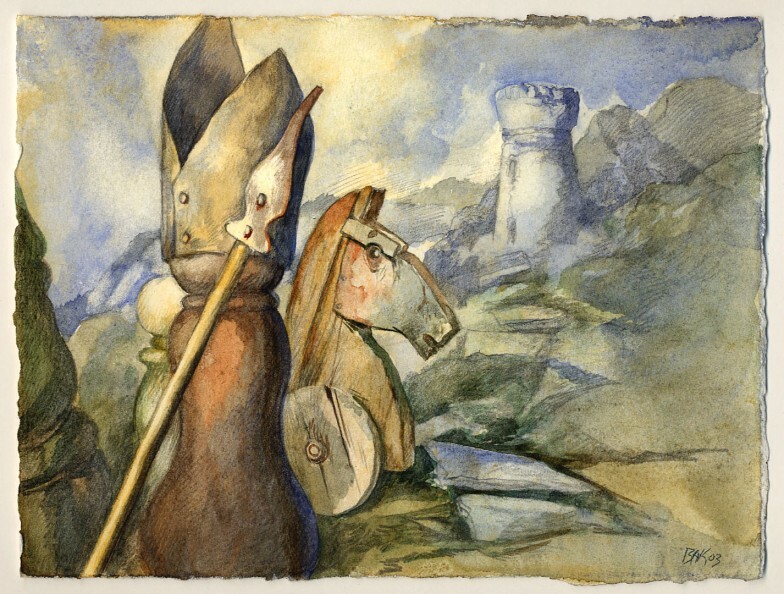 He painted “Les Échecs” (Chess). Robert Bolling Brandegee (1848-1922) was an American painter. In 1890, he painted “The chess Players.” It features a man and a woman engrossed in a game of chess. 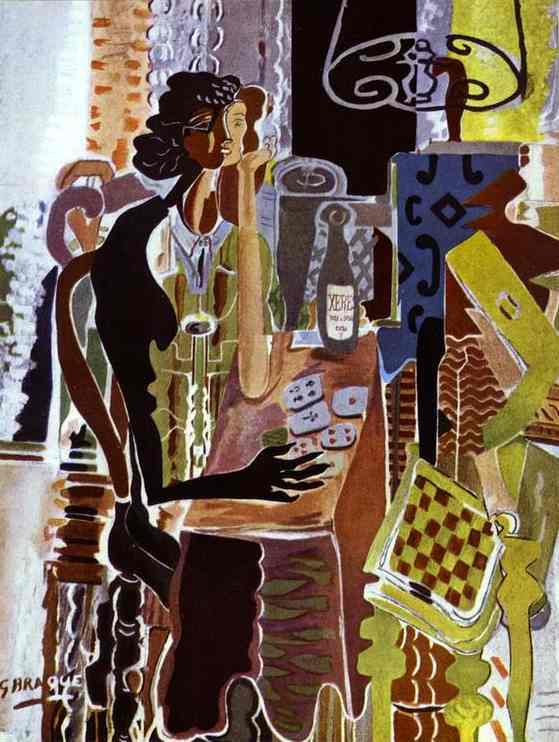 Georges Braque (1882-1963) was a major 20th century French painter and sculptor who, along with Pablo Picasso, developed the art movement known as Cubism. 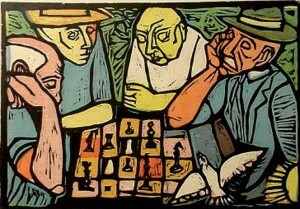 In 1942, he painted “La Patience” which depicted a chess board. Antonio Bresciani (1902-1977) was an Italian painter. 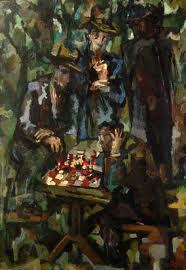 In 1977 he painted “Gioco de scacchi” (Game of chess). Frederick Arthur Bridgman (1847-1928) was an American artist and became known as one of the world’s most talented “Orientalist” painters. 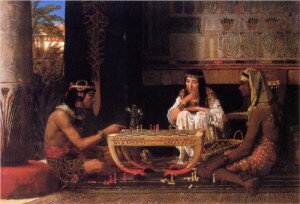 In 1881, he painted “An Interesting Game,” which hangs in the Brooklyn Museum. Lucy Madox Brown (1843-1894) was a British painter. In 1871, she painted “Ferdinand and Miranda Playing Chess,” depicting a scene from Shakespeare’s The Tempest. Szymon Buchbinder (1853-1908) was a Polish painter. 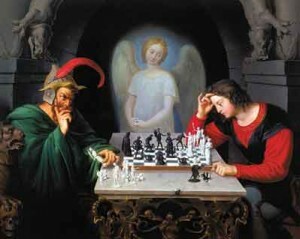 He painted “Partia Szachow” (Game of Chess).